Don't spend one more day with chipped, cracked or embarrassing looking nails! The Electric Nail Shaper Set will give you that professional look you've always wanted without expensive manicures. You don't have to ever manually work on those nails again. Just let the machine do all the work! Get a professional manicure without leaving your own home! 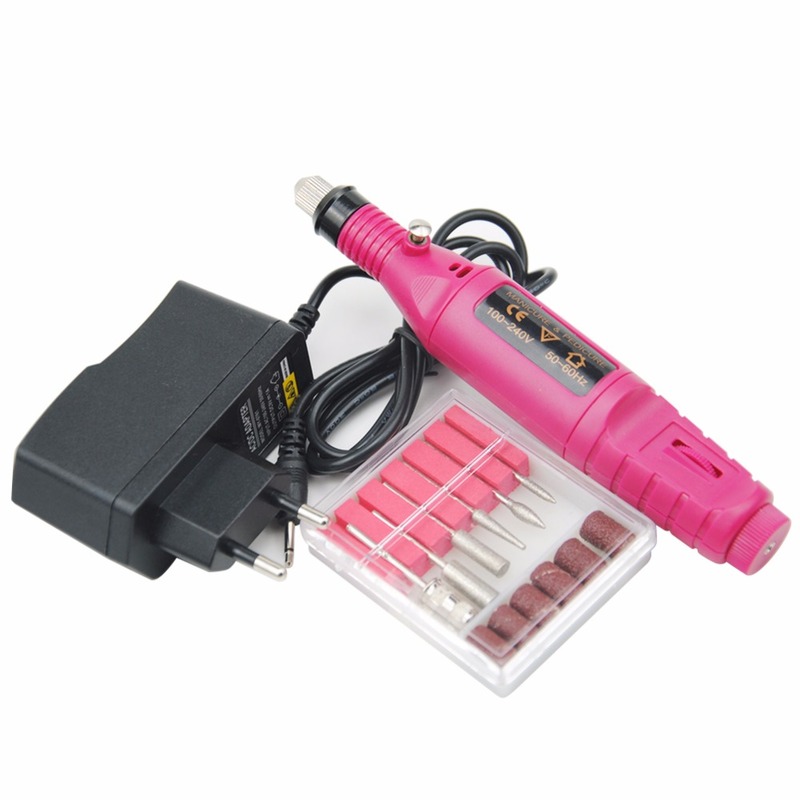 This electric nail set comes with more than 6 different attachments for polishing, filing and buffing your nails. High speed rotation, powerful enough to trim and shape tough acrylics and toenails, yet is also gentle to work on cuticles and weak or splitting nails. Suitable for manicures and pedicures. Compact and lightweight for easy use. Portable - you can take it anywhere! Keep the machine in a safe place. Keep out of reach of children. Do not touch the nail drill when it is rotating. Put on goggles before operating the machine to avoid clouds of dust and fines into the eyes. Power off when you do not use the machine. I like the drill. It comes with the different tips. Its very gentle. I wish it had more power. Overall it's good. Loved that it’s easy to use,especially loved the pedicure part,already buffered me feet,and nothing works like this. Pretty strong for a such small size machine. And a good price too. Pretty good for the price. The nail bits are not that great but the drill is great. It is what to expect for the price. You can order better quality drill bits somewhere else. It stopped working soon after I got it. The seller went above and beyond to replace the "defective" drill and I would buy from them again and I can say the drill does what its supposed to do, it works just as well as a larger drill and its easy to handle. But the biggest compliment goes to the seller for standing behind what they sell and they bent over backwards to make it right. I love this electric file. I absolutely hate getting a pedicure the idea of my feet being in a bowl that so many other feet have visited kills me. I save my one pedi for the late spring right when I’m ready for sandals so I need help maintaining my toes during the winter. This works perfectly!!! This made my day! I have significant nail psoriasis, which makes my fondernails and toenails very thick and clawlike. It was becoming difficult to wear shoes! But this guy is fantastic. It took some time, but I was able to shape my nails to “normal” nail shape again, for the first time in many years! The variable speeds and the different types of heads were really helpful, as I needed to be able to change things fairly frequently to get the results I was looking for. This little guy is super useful. It’s a little too powerful for fingernails, but the right head with a low speed makes it easier to work. The only cons I have is the length of the cord and that the body heats up fairly quickly. But neither of those are significant enough for me to be at all disappointed. I wish I’d taken before and after photos - it’s crazy, the difference! I had a nail drill for about 7 years so I decided to get an upgrade, and I'm glad I did. This drill is ultimately quite and strong. I love the fact you can change the speed settings with just one finger motion. It also comes with a couple of drill bits and attachments. They worked better then the ones I purchased from Sally's. Over all this is a great tool to use from prepping nails all the ways down to smoothing acrylic down. It's light and compact and it doesn't leave with a vibrating sensation like my old drill would. Definitely does the job. It gets my gel off in seconds and also is amazing when do acrylics! As described, works well - great price. The company stands behind their products.